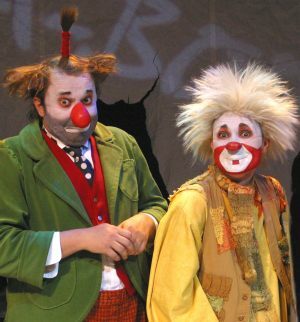 AGA-BOOM is rooted in the unique European theatrical style and universal language of clowning, it cuts through the barriers of language and culture with the art of slapstick, the humor of physical comedy and the delightful excitement of childhood. Aga-Boom is an interactive mayhem that carries audiences to the other side of the funhouse mirror with outrageous zaniness and unrestrained laughter. Created by veteran of Cirque Du Soleil Dimitri Bogatirev, AGA-BOOM was nominated for the Ovation Award, in the category of best touring show, along with The Producers, 42nd Street, Lily Tomlin and Elaine Stritch, as well as The Luna del Auditorio Award in the category of Alternative Productions, along with Blue Man group and Apocalyptica. Mayor Oscar Goodman of the city of Las Vegas, has proclaimed that September 7, 2004, was to be “AGA-BOOM Day”, an honor not achieved by many.